No-one has the power to stop people from seeking a better life. We should strengthen development cooperation. Analysts say a Chinese presence on Manus Island could impact the West’s ability to navigate the Pacific while offering Beijing close access to U.S. bases in Guam. Manus Island was a major U.S. naval base during the Second World War, playing a key role in Washington’s Pacific strategy. Recently, it has hosted one of Australia’s two controversial offshore immigration detention centres. Pence said the United States would partner with Australia and PNG on the Manus Island port project. “We will work with these nations to protect the sovereignty and maritime rights of Pacific islands as well,” Pence said. Australian Prime Minister Scott Morrison announced on Nov. 1 that his country would fund development of the base on Manus Island with the support of the PNG government. But neither party has sought support from local residents, Manus Island Governor Charlie Benjamin has said. Communities in sprawling, resources-rich PNG have at times opposed decisions made by the central government. Although the above article mainly focused on New Zealand, Australia is also concerned. China does not want more US-Australia military bases. As regular readers of this page are aware, since 2009 (in my book 2012 and the Rise of the Secret Sect), I wrote that China may take over Australia, and possibly New Zealand. Since I wrote that, my belief in that outcome has increased. On June 24, 2010, the day it was announced that she became Prime Minister of Australia, I warned that I felt that Julia Gillard would take steps to fulfill prophecies that also could get the Chinese interested in taking over Australia (see Australia Now Has a Female Prime Minister: Prophetic Ramifications?). I basically wrote the warnings about Australia, because Global Times was correct that it was originally established by the United Kingdom and became a British colony. Because of biblical prophecies to the B’rit ish, the ‘covenant people’ (for some details, watch British are the Covenant People), I was aware that certain prophecies that show blessings and cursings to the descendants of Joseph’s son Ephraim would impact Australia (see also Anglo – America in Prophecy & the Lost Tribes of Israel). The national and indeed international reactions to the Northern Territory Government’s decision to offer a century-long lease over the port of Darwin to Chinese company Landbridge can be divided essentially into two camps. 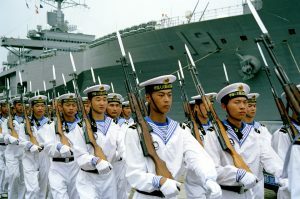 Those of the other side, including both Australian critics and, sotto voce, the Americans, see the deal as a more complex element in growing the People’s Republic of China’s (PRC) influence in Australia, which is increasingly constituting a threat to the country’s independence per se and to Western interests in the South Pacific and globally. The Australians hope that the USA will be able to protect them, while it also increases its trade with China (see After Obama announces stronger military ties to Australia, Australia makes a trade deal with China). Yet, the presence of US troops and other weaponry in Australia may be used by China as part of its possible future justification for taking the land of Australia. The Chinese may claim something to the effect that Australia is really a military pawn/representative of the USA and thus, since the USA owes them money, taking over Australia will help settle that debt. Events are aligning for various curses, like Australia losing its sovereignty and land (cf. Daniel 11:39; Lamentations 4:16; Joel 3:2-3; Amos 7:17; Ezekiel 5:1-2,12; 6:8; Ezekiel 22:13-15). And the Chinese threats in Global Times are proof of that. A while back, we made a video titled: Are Chinese threats against Australia for real? Should Australia and New Zealand consider that China has ambitions to control their territories? In the future, according to biblical prophecies, it is clear that Australia and New Zealand will lose their sovereignty. China remains the power that I think is most likely to dominate Australia, and it (or Japan) may end up dominating New Zealand. If those in Australia and New Zealand think that the USA will be able to stop this forever, they are mistaken. The USA itself will also be taken over one day per Daniel 11:39 (see also USA in Prophecy: The Strongest Fortresses). Like the rest of the nations, Australia and New Zealand need the Kingdom of God. But they very well may need to deal with horrors from Asian forces before then. Are Chinese threats against Australia for real? The Chinese paper ‘Global Times’ has carried threats in 2011 and 2016 suggesting the China would militarily intervene against Australia. It has declared that Australia is a ‘paper cat,’ that China will get revenge against it, and that Australia would be no more. Is this possible? Are there biblical and other reasons to think that this threat is real? Dr. Thiel answers these questions and brings up the fact that he has been warning about this threat since the last decade. This entry was posted on Sunday, November 18th, 2018 at 8:40 am	and is filed under Prophecy.